Hi there! Just popping in quickly while Luis throws some food on the grill. 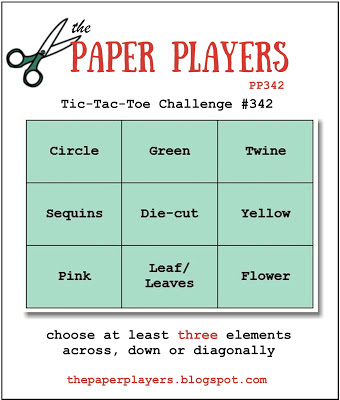 I've got a card for the Freshly Made Sketches challenge and the Paper Players Tic Tac Toe challenge where I used the bottom row - Pink + Leaf/Leaves + Flower. I used a Papertrey Ink leaf die in place of the circle on the sketch. The flower is Altenew which I watercolored with Distress Inks nd I added some Stickles to the center. That's it for tonight. Hope you have a wonderful week! So delicate and feminine Jen, just lovely! So gorgeous Jen, makes me want to get out my flowers and start stamping too! Gorgeous Jen. I absolutely love this. Great layout. Oh this is awesome! 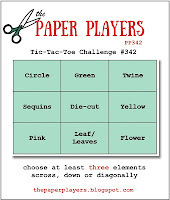 I love the colours you've used for your flower and leaves - they are really lovely together. Thanks for joining us at FMS this week! Such a pretty and delicate card! 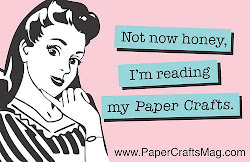 Thanks for joining us at The Paper Players! Love that flower with the leaves, Jen. Lovely card. Jaw dropping on the floor. You are making me look forward to barbecue season, where I can stretch my stamping time that little bit longer. :P Beautiful take on the sketch! What a stunning card! I love everything about it... The gorgeous die as background, the black sentiment strip and the amazingly colored flower. Great job!! Thanks for joining us at TIME OUT! 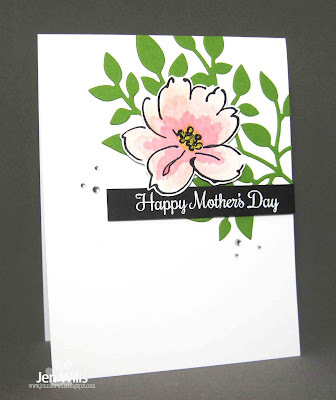 Brilliant use of the sketch Jen and love how you water coloured the flower, its so pretty. And the green behind it is the perfect background. So wonderful to see you at TIME OUT too!! I love the layers of pink in the flower - the leaves in the background is a great look!